Annual Report 2016-17: It is special to see the difference that we can make in our community through Computers in Homes, starting with training our adults, and filtering down to our tamariki. The confidence from when they enter the door on Day 1 versus when they walk out on Day 10 is phenomenal. The Computers in Homes programme gives families an amazing opportunity to discover and create a whole new world of digital literacy and connection . I feel privileged to be able to have helped our 50 families throughout this contract . I am saddened to see this programme end*, as it has been making a difference in the lives of so many families throughout New Zealand . But here at Southern REAP we are confident that 20/20 Trust will gain further funding for future digital literacy projects, and we can continue making a huge difference in people’s lives. This year has been slightly different in terms of the locations where we have delivered the programme . Previous classes have mainly been at schools, but this year we only had one group at a school . All the rest were held at community centres, a youth centre, a church, and at two REAP venues in rural Southland . This was for a number of different reasons, including schools not having an empty classroom for the training, or the groups being made up from families on our waiting list from the previous year. With the Number 10 Youth Centre, our focus was on parents of children who attended the Centre in some capacity but who all went to different schools . This received an overwhelming response with approximately 20 families still on the waiting list . As with South Centre, which is a Christian based drop-in centre – some of the Computers in Homes participants were from troubled backgrounds and had been helped through some tough times by the social workers and staff at South Centre. Relationships were formed with two new schools, Waverley Park Primary School and Fernworth Primary School in Invercargill . 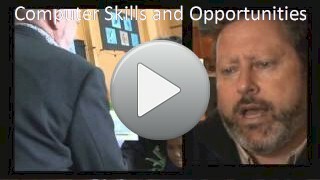 Feedback from both schools said that the training was extremely valuable, and that the opportunity given to the whānau to be able to engage in their children’s schooling with the use of the refurbished computers and subsidised internet has created a massive change . Increased confidence is more than apparent, and Computers in Homes has created so many opportunities for parents to go onto further training. Positive feedback continues to flow in . One student had gained the skills and confidence and was moving forward to fulfil a lifelong dream of applying to Teachers College . Another participant’s son had to stay late at school every day to complete his homework in the technology suite; now they spend quality time together at home doing his homework . One student has come on leaps and bounds and is now completing a Social Work Certificate at a tertiary provider in Southland. A huge thanks to Laurence Zwimpfer, Sue Davidson and the 20/20 Trust team who have supported us during the year . Your knowledge and dedication to the cause has been paramount to the success of this programme . We are looking forward and we are excited to see what will happen next . We hope to continue to deliver digital literacy programmes to our Southland Community with the help of the 20/20 Trust in the future. * Editors note: The coalition government announced in the Coalition Agreement they will restore Computers in Homes funding. We are eager to discuss this with the new government, as soon as they have settled in.